Series History: Georgia leads the all-time series 6 – 1. The latest installment saw the Bulldogs down the Tigers 53 – 28 in Athens. The 53 points scored in last year’s matchup was Georgia’s second highest scoring performance of the 2017 season, just behind their 54-point overtime win vs Oklahoma in the Rose Bowl. The 28 points surrendered by the Bulldogs was also their second most given up, again behind their Rose Bowl performance that saw their defense give up 48 points. 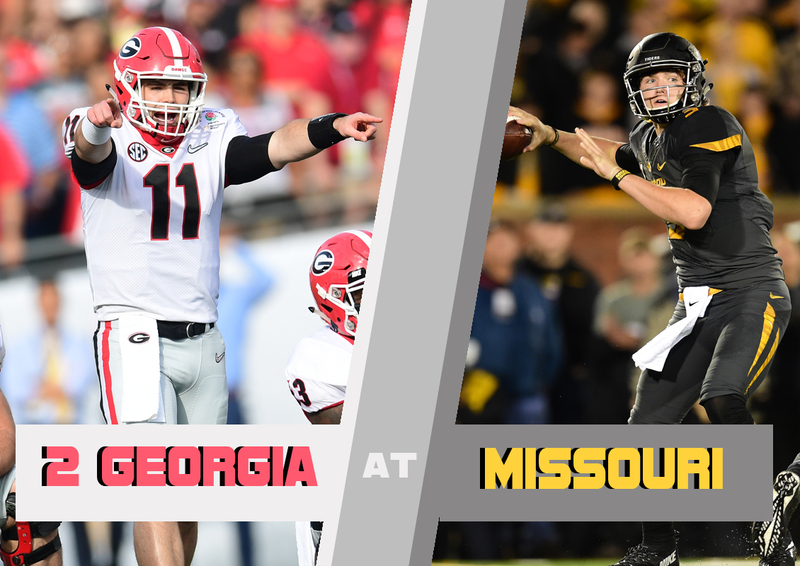 In Columbia: Georgia is undefeated when facing Missouri on the road (3-0). The Dawgs last road trip to Memorial Stadium saw Georgia emerge victorious 28-27 on a last second touchdown pass from Jacob Eason to Isaiah McKenzie. The average score when the two meet in Columbia is 34-16 in favor of Georgia. Offense – D’Andre Swift: The sophomore, and number one back for the Dawgs, only carried the ball four times for 12 yards against MTSU. Coach Smart was quoted as saying it was a “coaching decision”, but it will be interesting to see if the ultra-talented back will be full go for this SEC East matchup. Defense – Richard LeCounte III: The sophomore safety has been all over the field for Georgia through the first three games of the season. Stepping in for 4-year starter Dominick Sanders, LeCounte brings more of a “wow” play ability than his predecessor, but will have to be disciplined this weekend against a potent Missouri passing attack. Offense – Emanuel Hall: Missouri’s leading receiver entering this game, the 6’3 wideout enters this game nursing a groin injury that caused him to miss time in last week’s game with Purdue. Georgia fans should remember Hall well, as he torched the Dawgs for 141 yards and 2 touchdowns in last year’s matchup. Defense – Chris Turner: The sophomore linebacker is the best pass rusher at a school known for producing some good ones. He enters this week as Mizzou’s sack leader with 2. If this game turns into a shootout, it could be Turner who comes up with a huge play for the Tigers. Georgia wins if: They stick to who they are. There was talk this year, with Jake Fromm coming into his second season, that Georgia would make a concerted effort to find more of a run-pass balance. Through three weeks that remains to be seen. What is true is this; Georgia has one of the top-3 offensive lines in the country, even with Freshman – All-American Andrew Thomas banged up. Very few teams will be able to challenge the Dawgs upfront. With the bevy of backs at their disposal, Georgia is at it’s most dominant when it pounds the ball and uses the pass as a complimentary piece. Missouri wins if: They get Georgia away from who they are. Two things must happen for Mizzou to pull the upset. Establish a run game, even if doesn’t pick up much. You must make Georgia stay honest. If you allow Georgia to only rush four and sit back in coverage, you’re in for a long day. A commitment to running the ball will keep Georgia’s young but talented linebackers’ eyes in the backfield and let you get the ball to your receivers in space. It may sound cliché, but Missouri must commit to stopping the run. Fromm has only been tested once this year, the first half against South Carolina. The Gamecocks were able to stop the run game enough to force Fromm into some long yardage throws and a couple of mistakes. If Mizzou’s offense is clicking and the defense can force a couple of takeaways, the upset is possible. The game kicks off at noon ET, and should be a hot one. Temperatures are expected to be in the high 80’s to low 90’s. That’s nothing new for the Dawgs who have played 3 scorchers to start the year. Should be a fun one in Columbia!